As a fellow New Yorker and a member of the Knick nation let me start off by saying that we have never been more excited and thrilled with our Knicks in over a decade. This seasons on court display and attitude has given us hope and belief that we can go a long way when it comes to reaching the heights where the Knicks should be every single season. KEY: Teamwork! and the one and only Carmelo Anthony! Melo’s stats throughout the years speaks for itself, however this season he is showing the maturity and the influence of a true MVP candidate. Whether Anthony gets the MVP award is a personal achievement, what concerns me is the team effort in making this season better than, well, just about every other season the past 10 years. It’s been a roller coaster ride this season, but there is always a buzz around the city when the Knicks play. The kinda buzz this city has been yearning for, for a very, very long time. I’m not gonna comment on individual players and get into who i like and who i think needs the ax. But there is one name i’d like to mention. Mike Woodson! Since taking over from D(umb)antoni, Woodson has been very effective in getting the best out of his players. His tactics and basketball philosophy and his father like approach has not only his players believing in him but also this city too. 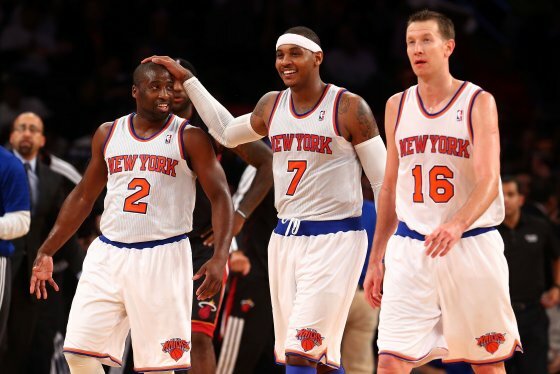 Whether this season will be a successful one for the Knick nation remains to be seen. Personally, i’m expecting East semis or finals at the very least! I still think it would be a tough task getting past LeBron James and co’. No matter the outcome, I thank the Knicks for their entertaining basketball and as a Knickerbocker I am very much accustomed to saying “There is always next year”.